This page collects together publications on issues related to women in politics from both the Pacific and the world. It collects together research documents, campaigning resources and key papers. If you have a publication we have missed, please send it to the PacWIP team at pacwip@gmail.com. 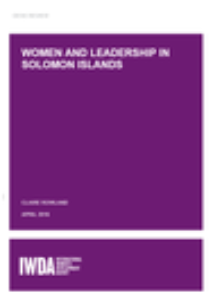 This desk review on ‘Women and leadership in Solomon Islands’ was commissioned to assist IWDA to reflect on the potential direction, approach and suitable partnerships for the FLOW program development in Solomon Islands. Drawing from journal articles, local news reports and grey literature, this review has sought to address key questions, including: (i) What are the enablers and barriers to women’s (and young women’s) political leadership and participation in Solomon Islands? (ii) What are the avenues for women’s leadership outside of formal politics? How are these roles and opportunities perceived? (iii) What work is being undertaken by CSOs/women’s networks and agencies in Solomon Islands to promote leadership? (iv) What lessons have been learned from existing women’s leadership programs in Solomon Islands that can be drawn from in the development of new programs? 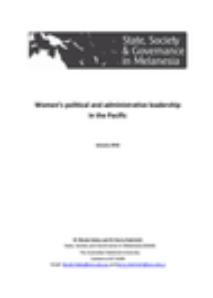 This paper provides an overview of women’s political and administrative leadership in the Pacific. It has been prepared to inform forthcoming design work being undertaken by Pacific Women. 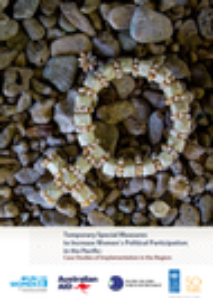 The paper incorporates and expands upon an earlier concept note we prepared to inform the original Pacific Women design (Haley and Zubrinich 2012), and considers women’s leadership and participation as it relates to formal institutions and processes, including national and subnational government, the public sector and civic engagement. The United Nations Development Programme (UNDP) and UN Women, in partnership with the governments of Samoa and Australia, advocate for women’s political rights and through the implementation of the Increasing Political Participation of Women in Samoa (IPPWS) programme are providing training for those women who want to run for office. IPPWS’ trainings aims at supporting women to overcome the barriers they face by strenghtening their skills to exercise leadership and contribute to political life for the benefit of the entire nation.As part of the programme, UNDP and UNWomen launched a handbook titled “Building Blocks for Gender Equality: What Political Parties Can Do to Strengthen the Participation and Representation of Women.” The publication was written by Elizabeth Weir, Canadian national and senior international parliamentary expert, that is also facilitating the IPPWS trainings in Samoa. 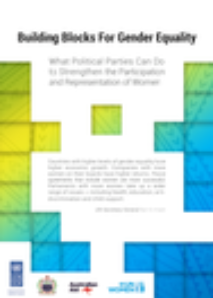 The publication identifies targeted interventions for promoting the stronger presence and influence of women in political parties. It highlights the benefits for the parties of taking action on Gender Equality, indicate effective measures for ensuring women’s participation in the operations of the party and provide ideas on how to offer financial and mentoring support to candidates during the election process. Institution: Increasing Political Participation of Women in Samoa. UNDP Multi-Country office, Samoa. Since the 1950’s Australia has provided scholarships for men and women from developing countries to study at Australian tertiary institutions to ‘develop leadership potential’. Recipients are expected to ‘make a significant contribution to their home countries as leaders in their field’, and be part of an ‘engaged and influential global network of leaders, advocates and change-makers’. The Office of Development Effectiveness evaluated the contribution that scholarships make to women’s leadership. The evaluation included interviews, a document review, and a global analysis of tracer studies in which scholars are asked about experiences and outcomes after completion of their scholarship. Actions needed to improve women’s leadership outcomes from scholarships were identified. The evaluation found that: Most women are employed after returning home; Just over three quarters of women report having greater operational or technical responsibility, and just over half report having greater financial responsibility within the first three years of return from a scholarship; Most women move into higher positions after their scholarships; Almost all women and their supervisors felt that scholarships contributed to a great or medium extent to professional advancement. 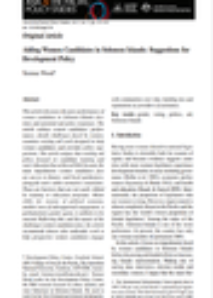 This research by Terrence Wood discusses the poor performance of women candidates in Solomon Islands elections and potential aid policy responses. The article outlines women candidates’ performance, details challenges faced by women, examines existing aid work designed to help women candidates and provides policy suggestions. The article argues that existing aid policy focused on candidate training and voter education has achieved little because the main impediments women candidates face are access to finance and local gatekeepers, alongside more subtle normative constraints. These are barriers that are not easily shifted by training or education programs. Meanwhile, for reasons of political economy, another area of aid-supported engagement, a parliamentary gender quota, is unlikely to be enacted. Reflecting this, and the nature of the challenges women candidates face, the article recommends donors also undertake work to help prospective women candidates engage. 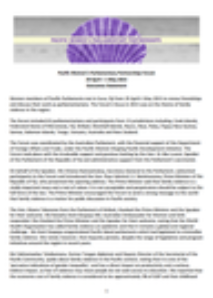 This report captures the high quality discussions of the "Pacific Regional Conference on Temporary Special Measures", held in Port Moresby in November 2015. This conference was a joint initiative of UNDP, the Pacific Islands Forum Secretariat and UN Women’s Multi-Country Office in Fiji, with the financial support of the Australian Aid program. The Konrad-Adenauer-Stiftung (KAS) is a political foundation. 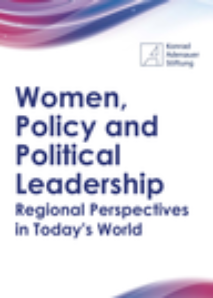 The report aims to share perspectives on women in political leadership from the regions of Africa, America, Asia, Australiasia including a piece on Pacific trends, and Europe. Women’s participation in politics and their secure access to political life is very important for democratic development and sustainability. After overcoming stiff resistance and negotiating for their rights, women all over the world have mobilized across political lines and from the standpoints of different social and cultural status and ethnic affiliations to work towards the goal of gender equality. The hard work has paid off and there have indeed been positive changes in most regions of the world: the average number of women in parliament has increased from 15.7 percent in 2004 to nearly 22.2 percent in 2014; but we are still some way away from the Beijing Platform for Action target of 30 percent women in decision making positions. The Overseas Development Institute (ODI) is the UK's leading independent think tank on international development and humanitarian issues. 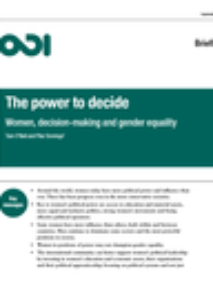 This ODI report focuses on women’s decision-making power, in particular their ability to influence political decisions about the distribution of public authority, rights and resources. It looks at the reasons for women’s increased presence in public life around the world, and why women in some socioeconomic groups, sectors and countries have less political power than others. It also examines when and how women have power and influence in practice, and what they seek to achieve. Recommendations on how the international community can better support women’s access to decision-making and leadership are presented as well. Institution: Overseas Development Institute (ODI). women of Bougainville. BWF’s objective is to advocate for the priorities and needs of women by influencing the development of legislation, policies and programs across the Autonomous Region of Bougainville. The BWF Board made the decision to come up with an assessment of young women’s needs and a capacity building program to respond to these. 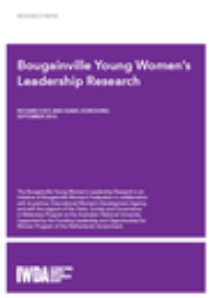 To inform this work, BWF needed data to understand the situation surrounding young women and participation in leadership activities, instead of starting from their own assumptions. This report is the result of that piece of research. This report provides the findings, analysis and policy significance of research aimed to better understand the barriers to women’s political participation in Samoa. The paradoxical situation is that Samoan women have achieved approximate equality to men in most modern spheres of government and the economy, yet have never, since Samoa’s independence in 1962, succeeded in winning more that five seats in the 49 seat parliament. In most parliaments, women have held only one or two seats, usually for a single term. In 2015 Samoa was among the countries ranked lowest int he world for women’s representation in parliament, at 128 out of 140 countries. The research was conducted with assistance from, and in collaboration with, the Ministry of Education, Sports and Culture (MESC) and the Ministry of Women, Community and Social Development (MWCSD) over the period April 2013 to July 2015. 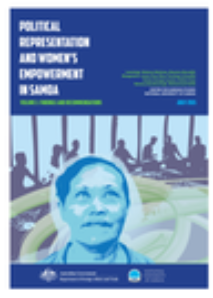 It consisted of (i) a nationwide survey of women’s participation in political and economic village-based organizations, covering all villages and sub-villages in Samoa; (ii) a qualitative study of village organisation in a sample of 30 villages with and without formal obstacles to women’s participation in village government, and (iii) interviews of women candidates who have stood for past elections. 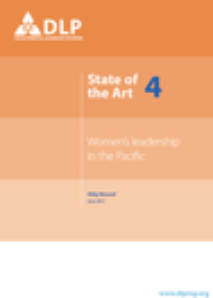 This paper summarises the state of knowledge on women’s leadership in the Pacific. It concentrates on three spheres: 1) formal politics, the main focus of the literature on women’s empowerment; 2) the bureaucracy, an important employer of women; and 3) civil society, where Pacific women are particularly active. It highlights that Pacific women’s prominent informal peacebuilding role has not always led to their participation in formal peacebuilding processes: opportunities to facilitate equitable social and political change have been missed. In relation to the limited evidence base, it notes that women’s impact on governance and policy-making in the region has received little scrutiny. 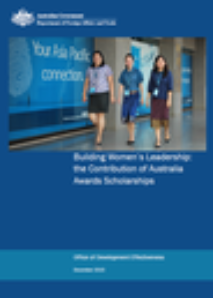 Further, although gender analyses carried out as part of donor-funded capacity development programmes contain much information on women’s participation in Pacific bureaucracies, this material is rarely made public. This is the Outcomes Statement from the Second Annual Meeting of Pacific Women Parliamentarians. Women members of Pacific Parliaments met in Suva, Fiji from 29 April to 1 May 2015 to renew friendships and discuss their work as parliamentarians. The Forum’s focus in 2015 was on the theme of family violence in the region. The forum included 63 parliamentarians and participants from 15 jurisdictions including: Cook Islands, Federated States of Micronesia, Fiji, Kiribati, Marshall Islands, Nauru, Niue, Palau, Papua New Guinea, Samoa, Solomon Islands, Tonga, Vanuatu, Australia and New Zealand.